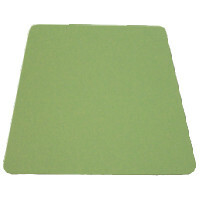 Geo Knight 40" wide heat-conductive 1/8” thick green silicone high temp pads for pressing miscellaneous rigid surfaces and tiles. This silicone padding is designed to be placed between the tile or other rigid blank and the upper heat platen and provide a more even distribution of heat and some limited radius wrapping. This padding is sold by the yard. See below for available precut sizes.